Dental Implants Are an Investment, Not a Liability! Some teeth are lost due to poor dental hygiene and some causes are things out of our patient’s control like natural causes. Despite how a patient may have lost their teeth, dental implants are a way to give our patients their smiles back. They’re one of the best ways to invest in yourself because everyone knows a better smile means more confidence and a higher quality of life! If you have lost teeth, no matter the reason, dental implants can help regain your confidence among many other oral health benefits. Let your dentist help you restore your teeth, self-esteem, and lifestyle with this revolutionary restoration. Contrary to popular belief dental implants are not expensive. They’re a true investment in your overall health—not even isolating the benefits they pose just for your oral health. When someone evaluates the return that their initial investment has along with the long-term benefits that they experience with dental implants, it’s clear to see that dental implants are well worth their cost. Think about it. How much would you pay to stop being embarrassed of your missing teeth? Or for security and the ability to eat your favorite foods again? Dental implants can seem expensive, but that’s only because an entire team of highly skilled, trained professionals need to be involved to achieve your desired results. When patients choose to get dental implants, their procedure is conducted by an advanced oral surgeon. It’s completed this way because it’s the safest practice, standing at a success rate of at least 95%! You can rest assured that your dental implant placement will be treated with the utmost care during your procedure. After your procedure, your dental professionals are there for you every step of the way. They even provide you detailed at-home care instructions that are customized to you and only you. Secondly, the materials used in your dental implant placement can be seen as expensive as well. To reach your smile goals with dental implants, these materials are completely necessary. The titanium implant posts are created with highly technical computers and advanced software. This advanced technology also helps the doctor to place your dental implants in the perfect places. Finally, there are patients that may require bone-grafting which could be another cost. If you’re not the perfect candidate for dental implants initially, it may be because you lack density within the jawbone. 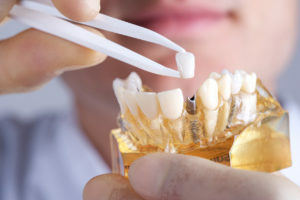 Thankfully, if this is the issue, you can undergo a bone grafting procedure to reconstruct your jawbone, making it strong enough to go to hold your dental implants in place. Having a healthy, full smile comes with unlimited benefits—especially when your smile is supported with long-lasting dental implants. The bottom line is clear: dental implants are one of the best investments you can make in your oral health. It’s also great for your overall health. If you’re looking for the perfect fix, consider how dental implants could be the best decision you make for your smile. Here at the office of Dale W. Greer, DDS, we know many people lose their teeth for different reasons. We also know how important it is to replace them. That’s why we’re committed to providing long-lasting, effective solutions to our patients, which is why we stand behind dental implants. If you’re interested in restoring your smile, contact us! Comments Off on Dental Implants Are an Investment, Not a Liability!